It began with three knocks at the front door of the Cathedral Shrine of the Virgin of Guadalupe and Bishop Edward J. Burns was greeted and welcomed into the Diocese of Dallas by the diocese’s auxiliary Bishop Greg Kelly. It was the start of the installation ceremony for Dallas’ new Bishop with a Wednesday evening Solemn Vespers Service. The next afternoon Bishop Burns would take the seat of the Cathedral officially becoming the eighth Bishop of the Diocese of Dallas. Thursday afternoon people began lining up two hours before the 2pm ceremony on the steps of the Cathedral waiting to see their new shepherd. Some of the diocese’s parishioners set up banners welcoming the bishop and began playing music and dancing to greet the procession of deacons, priests, bishops and cardinals. Before the ceremony began Bishop Burns held a press conference with the local media where he expressed his gratitude to the people of Dallas for welcoming him and for his appointment by Pope Francis. When asked about what he thought about the “chilly” 50-degree day in Dallas Bishop Burns replied “this is balmy…coming from the Diocese of Juneau, it’s the largest rainforest in the northern hemisphere, so I think the lord is really smiling on this wonderful day.” The bishop concluded his time with the media by asking for prayers of those watching and listening as he begins his new ministry in Dallas. Following the press conference Bishop Burns joined the gathering of deacons, priests, bishops and cardinals for the procession into the Cathedral. 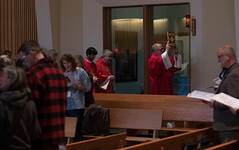 Joining in the procession were Diocese of Juneau priests, Fr. Pat Casey, Fr. Mike Galbraith and Fr. Pat Travers, as well as Anchorage Archbishop Paul D. Etienne and Archbishop Emeritus Roger Schwietz. Those in the procession were met by crowds of people, singing and dancing before they made their way inside the full capacity Cathedral. 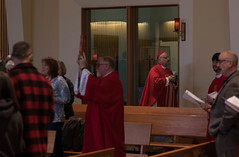 As Bishop Burns passed by the crowds of people you could see his signature smile as he waved and shook hands with the people of Dallas who made time in the middle of the week to welcome him. Once inside the Cathedral, Archbishop Christophe Pierre, Apostolic Nuncio to the United States, read the Apostolic letter from Pope Francis appointing Bishop Edward Burns the new Bishop of Dallas. Then Archbishop Pierre gave Bishop Burns the Papal Bull to show his predecessor Cardinal Kevin Farrell, as well as Cardinal Donald Wuerl, Cardinal Daniel N. DiNardo, the Bishops in attendance and others in the congregation. It was after sharing the Papal Bull that Bishop Burns sat in the Cathedra officially becoming the Bishop of the Diocese of Dallas.